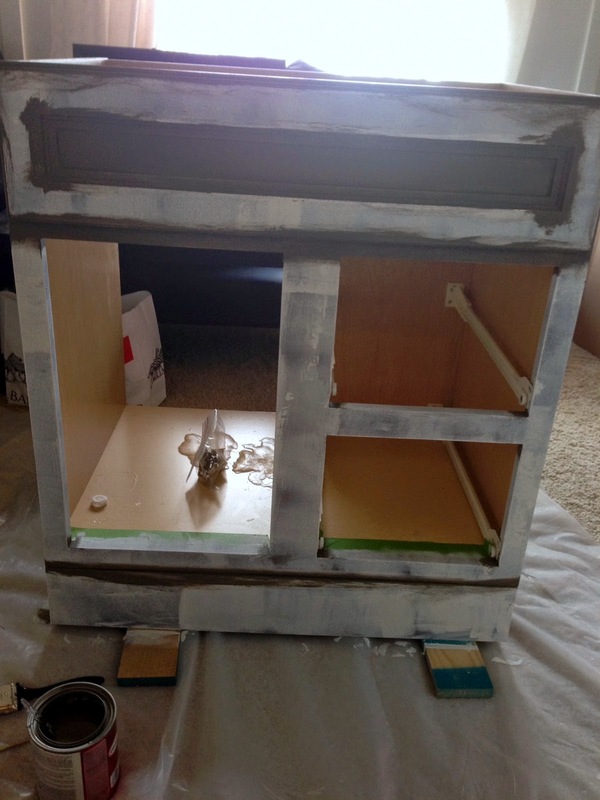 On Tuesday I shared a little sneak peak of our vanity makeover for our new bathroom. It's not completely finished yet (there are a few touch ups to be made) but it is so close, I thought I would share. Let's go back and see what we started with. The cabinet was in good condition, the brown was just not going to cut it in this new serene white and gray space we have been creating. 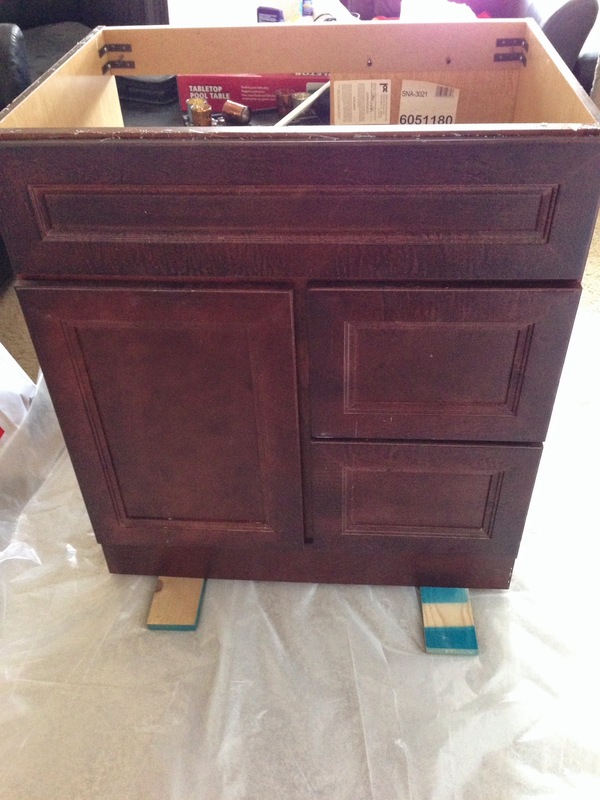 I have refinished a few pieces of furniture this way, including what I now use as my TV stand, which has held up great over the last 4 years, so I figured following suit and doing this the same way should provide great results. The vanity has been residing in our extra room next to the bathroom so Martin helped me put a drop cloth underneath and prop in off the floor with some scrap wood. First we removed all the drawers and door and hardware. Then we then gave everything a light sanding, and wiped it all down with a liquid deglosser to make sure the surface would be ready for paint. 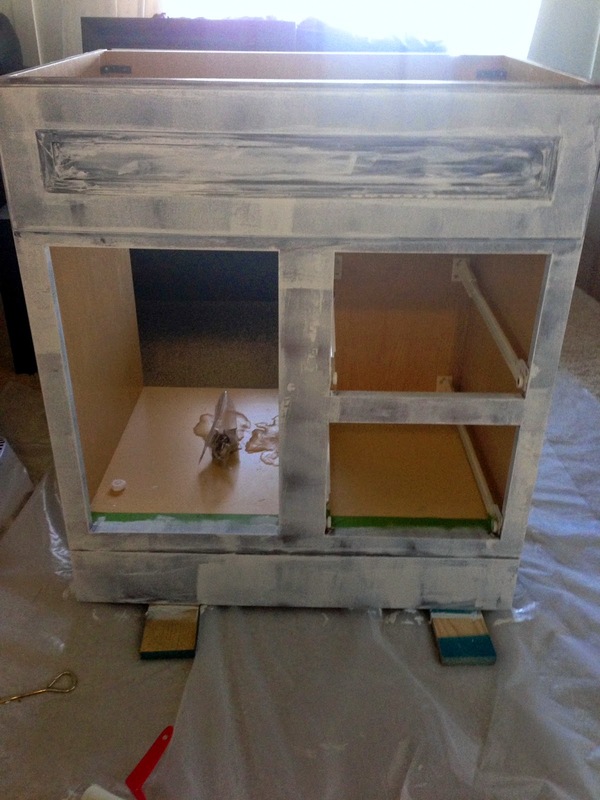 I have learned that the best primer to use in this type of situation, where there has been some sort of previous shiny finish that you haven't fully removed, is an oil based primer - it will grab hold to anything, including laminate. 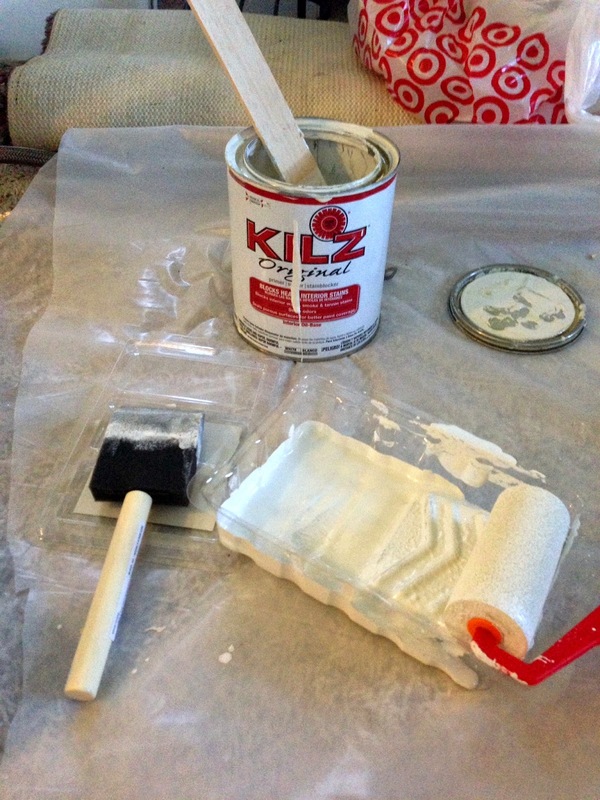 I just went with the original Kilz primer this time because that is what I had on hand. Since cleaning up oil based paints can be a pain I tend to stick with cheap foam brushes that I can just chuck when I'm done, then I don't have to really worry about the clean up! I started with the foam brush getting into all of the raised details and nooks and crannies that a roller wouldn't be able to do. Then I went back in with the roller to give a nice even coat to all the flat surfaces. It doesn't look pretty, but that's not the point. The primer is just giving the latex paint something to adhere to so it doesn't come peeling off the otherwise previously shinny surface. The nice thing about this primer is that is dries relatively quickly so within an hour or so you are able to move on to the paint, aka making it look pretty. I approached applying the paint in a very similar way as the primer, using a brush first to cover all the raised details and little corners. And then going back in with a roller to tackle all of the flat surfaces. Already looking so much better! The paint I used was Glidden's Flat, color matched to Behr's Dusty Mountain. I went that route simply because my TV stand, which is finished in the same color, was done the same way and I wanted the colors to be a match. I went with the flat because I knew I would be adding my own protective finish, versus jumping right in with a high gloss paint, which is always an option as well. 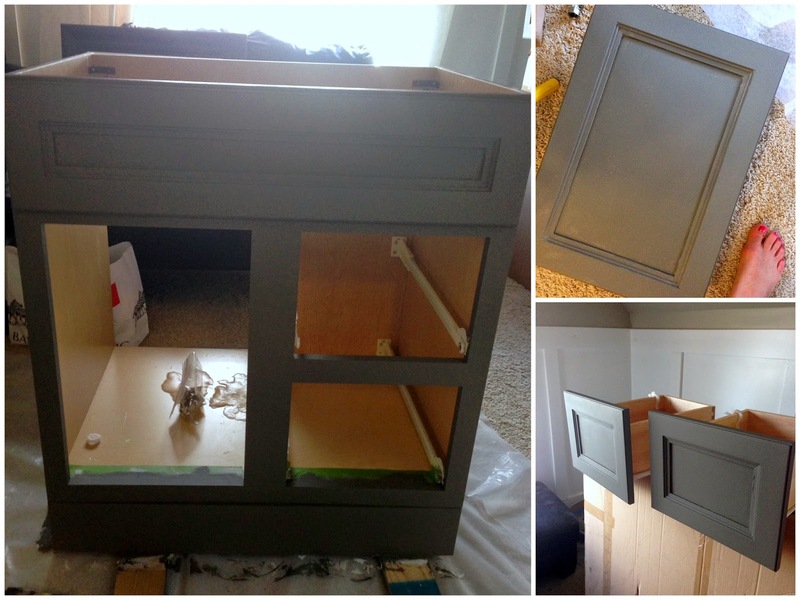 After the vanity, drawers, and door had received two coats of paint it was dry time. I let everything sit out for the week and didn't even bother tackling the next step till the following weekend. I truly believe that the key to the longevity with these refinished pieces is allowing everything ample time to dry and cure. Trust me, I have learned that lesson the hard way! It's just so hard when you see your nice and newly painted piece to want to get to actually using it, but then it tends to get scratched and dinged because the paint is still soft. Its just like getting a manicure and reaching into your purse before the polish has fully cured, it's never pretty. The next weekend I went back in with a poly protective coat. I have had this little quart around for years and used it on many projects. So far nothing I have used it on has shown any discoloring or yellowing, so since there is still stuff left, I'm sticking with it. 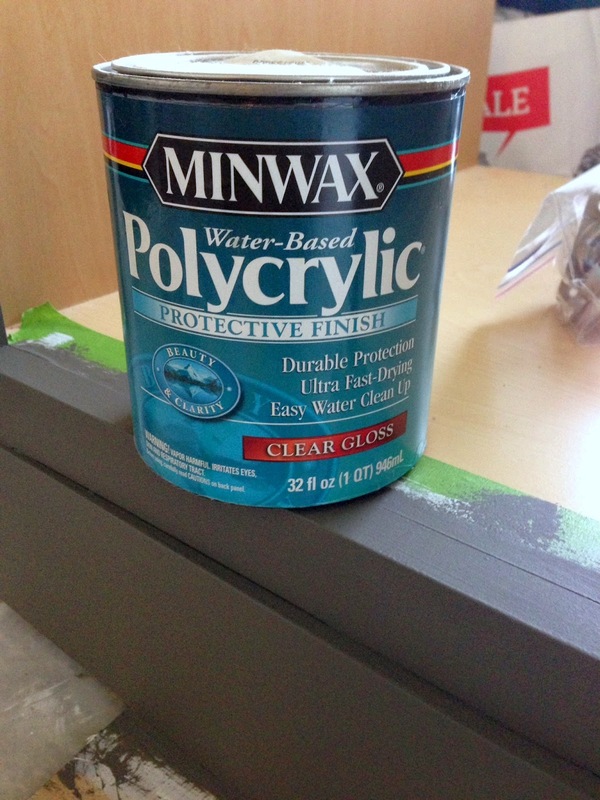 I've learned that this finish is best applied with a brush to help minimize any bubbles in your finish. It's very thin, and it needs to be applied very thin, otherwise you end up with these lovely whitish drips on your newly refinished piece. I usually apply two coats, which I did in this case. I few ugly drips showed up which are the few touch ups I mentioned in the beginning that I need to take care of. You can see in the image above on the far left, as well as inside the door frame on the right the white. Those would be those pesky drips that need to be fixed. But other than that, you can see how the piece now has a nice shiny finish, which will be great for the bathroom because now it can be easily wiped down, and hopefully withstand the constant change in temperature that a bathroom tends to go through. It may not be at the fully pretty stage yet, but it will be soon. Whenever you can't find the right piece for the space, don't be afraid to make the right piece for the space!